Which Pre-Shave Cosmetics to Choose: Shaving Foam, Soap or Cream? Pre-Shave Cosmetics. 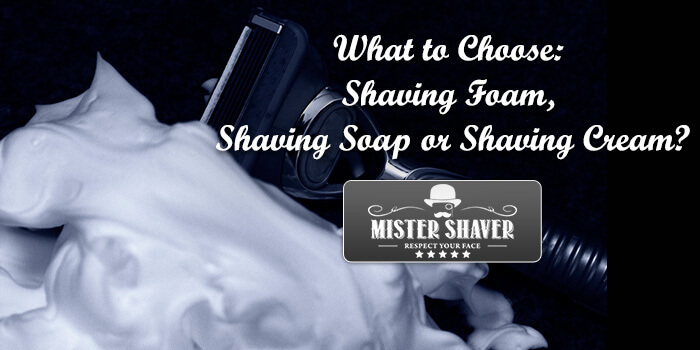 What to Choose: Shaving Foam, Shaving Soap or Shaving Cream? A smooth shave would be impossible without a rich lather that serves three main functions: it lubricates, opens up the pores and desensitizes the skin. You can get this lather from various types of pre-shave cosmetics, such as shaving soaps, foams, and creams. Choosing between these types can be confusing, especially when you’re not aware of the major differences between them. A shaving soap is a kind of soap that is whipped up into a lather before shaving. Shaving soaps have been in use since the early nineteenth century. Their popularity has died down ever since shaving creams and foams were introduced. However, this pre-shave is still used by many people who prefer the traditional ways. Shaving creams generally contain oils, soaps, and water to give lather for a perfect shave. Shaving creams are available in tubes and pressurized cans. In order to create lather out of the cream from tubes, a shaving brush is required. Shaving foams can be bought in pressurized containers and they do not need to be lathered up. They can be simply applied to the face; this eliminates the need for a shaving brush. The following pros and cons of each of the pre-shave products highlight the main advantages and disadvantages. These may vary from people to people, and there is no hard-and-fast rule regarding the best option from the three. You should choose a product that works best for you. Shaving foams come in pressurized containers and are the easiest of all to use. Extremely easy to use; all it takes is to apply the foam to the face without the need to create a lather. This saves time and is convenient for many people. Traditional shaving soaps still haven’t been eliminated by the newer types of pre-shave cosmetics. Here are some pros and cons of using a shaving soap. They are generally slicker because of the numerous ingredients such as glycerin, lanolin, tallow and bentonite clay. This provides a smoother shave, especially for people who have dense facial hair. There is no single type of pre-shave cosmetics for men that fits everyone. Try different types (soap, cream, foam, gel) and choose the one that you feel most comfortable with.